The origin of the universe is one of the greatest scientific mysteries of our time. And proof of inflation — the hypothesized moment following the Big Bang, when the universe expanded exponentially — has become a highly pursued line of study. Chile’s Atacama Desert is the site for one such project. There, at high elevation, a single Polarization of Background Radiation (POLARBEAR) telescope probes the skies for extremely faint signatures of inflation. And soon that telescope will be joined in its search by two others: the Simons Foundation has awarded co-investigators Brian Keating and Adrian Lee $4.3 million to build two additional telescopes, and implement improvements to the existing device. Together, the three telescopes will be known as the Simons Array. If inflation did in fact occur, researchers theorize that it would have left ripples in spacetime known as gravitational waves. These waves, in turn, would have left behind signatures of polarized light called primordial B-modes. The Simons Array, when complete, will provide a clearer and more accurate view of these primordial B-modes. 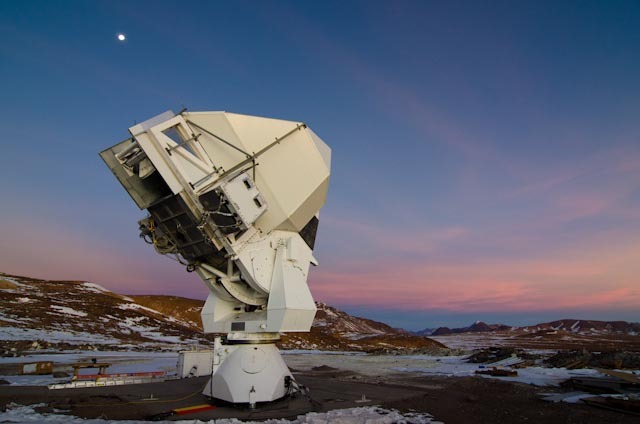 The first telescope, the Huan Tran Telescope, has been operating since March 2012, when it began recording potential B-mode data from a largely self-contained site at 17,000 feet above sea level. The site’s high altitude means that the Simons Array will already lie above about half of Earth’s atmosphere. What’s more, the site’s dry climate will allow for improved detection of the extremely faint B-modes.